An accountant is an essential component of every small business. Audited accounts must be produced by any business turning over more than £5.6 million pounds and submitted to HM Revenue & Customs (HMRC), but businesses turning over less than this should still produce a set of accounts to support their tax claims. Accountants, though, offer many more services that your business could make use of. Use your accountant as a business asset, but keep an eye on the costs as if you ask your accountant to perform specialised work on your behalf, this could be very expensive. Simply searching the web for an accountant in your area will reveal that there are hundreds that you could contact. As with all services for your business you should take your time to choose the right accountant. All qualified accountants are either certified or chartered. Use one of the organisations below to locate an accountant and also help you choose the right person for your business. Remember that you could have a long relationship with your accountant so choosing the right person to work with is crucial for your business. Ask how large the accounting practice is. Smaller businesses in particular can benefit from smaller practices as they can offer a more personal service. Try and void large accountancy firms where you may not speak to the same accountant twice. Trust and efficiency go hand-in-hand. You trust your accountant to handle your business’s financial affairs, which must always be professional and efficient. Try and get testimonials from other clients to check what they think of the accountancy firm. Charges are always important to smaller businesses. Ask about the accountant’s scale of charges so you don’t get any nasty surprises. Telephone costs are particularly important. If you call your accountant for advice you will most likely be charged. Keep all of your income and outgoings as separate files. This will help your accountant see your financial position quickly, especially when it comes to calculating your tax bill. Always keep every receipt for every purchase you have made if you think this will be an allowable expense. These records could be requested by HMRC if they want to make an enquiry about your expense claim. VAT can be a complex system if you don’t understand it fully. 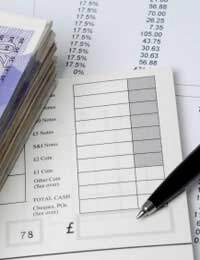 Keeping your VAT records up-to-date before you present them to your accountant will reduce their bill, as they don’t have to do as much work to generate your VAT accounts. Try and present your accountant with your financial records in an easy to understand way. One ideal method is a spreadsheet that simply shows your income (paid invoices), and your outgoings (everything you bought for your business that is an allowable expense). If you have employees, you have to keep PAYE records by law. If you use an external bookkeeper for this part of your business, make sure they present you with up-to-date records before you give these to your accountant. This will save them querying any of the records that saves time and reduces the accountant’s bill. The account you choose should become a valued member of your business’s management team. Try and have regular contact with them especially around tax time but try and develop your relationship to ensure you always get an efficient service and value for money. Periodically evaluate your accountant to see if they are still providing the services you need to run your business efficiently. If you feel that you are no longer getting value for money, consider switching to another accountant.